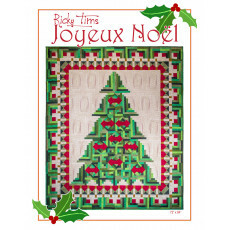 Ricky Tims designed this stunning holiday quilt primarily based on the beloved log cabin block. Bow tie blocks are incorporated into the tree for decorations and a fully pieced border wraps this unique Christmas tree with holiday cheer. Although the blocks are fairy simple (log cabins, quarter-square triangles, etc. ), you’ll want some time to get this one finished for December! Everyone pre-ordering the kit or pattern will be automatically get Ricky’s video tutorials for this project for FREE!